The University of New South Wales (UNSW) has reopened the UNSW Bookshop after a major refurbishment, with a reading room, central room for events, and new Atomic Press cafe. 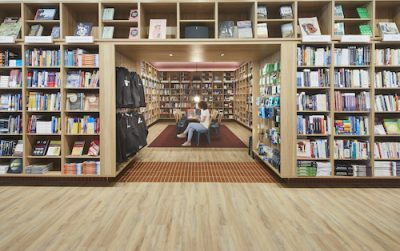 The 430-square-metre shop is situated within UNSW’s Kensington campus; the introduction of the new spaces, which are open to the public, allows the bookshop to extend its services beyond the university and into the broader community. An expanded events program will include book launches and talks from Australian and international authors and performers, as well as book clubs, student events, and storytelling sessions for children. UNSW president and vice-chancellor Ian Jacobs said, ‘I am delighted that our UNSW Bookshop has been refurbished and expanded. A love of books, reading and writing is a feature of our university community and we undertook the refurbishment to create a welcoming and stimulating environment. The store’s range of trade books has expanded to include fiction, nonfiction, children’s, illustrated art, design, architecture, food and travel books, as well as a targeted selection of international books. The store continues to sell a wide range of educational books, course materials and UNSW-branded merchandise. The bookshop is independently managed by UNSW Press, a company owned by UNSW, and is the only university press in Australia to manage a bookshop. The UNSW Bookshop won Campus Bookseller of the Year in 2017, 2016, 2014 and 2012, and was runner-up in 2015. For more information, visit the UNSW Bookshop website.